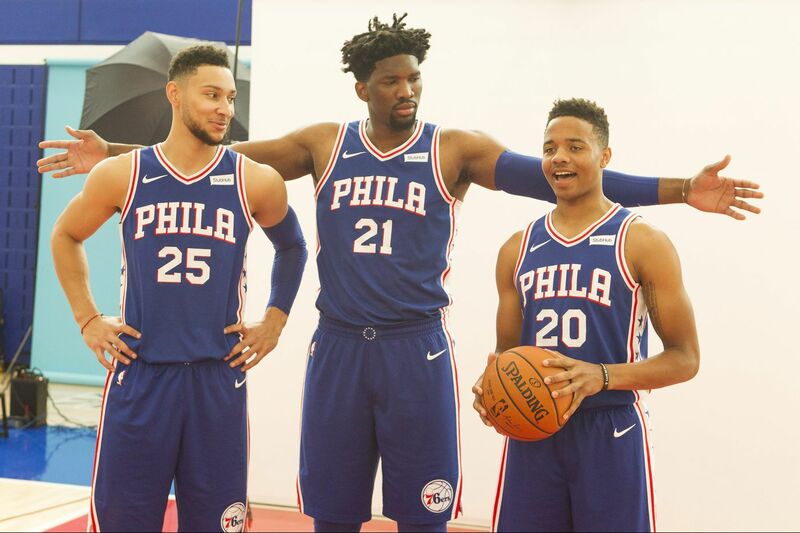 Where the Sixers finish in the Eastern Conference this season will rely heavily on the progression of Ben Simmons, Joel Embiid and Markelle Fultz. Markelle Fultz is a starter because of Kawhi Leonard. He's a starter because of Kyrie Irving. He's a starter because of Gordon Hayward. He's a starter because Brett Brown understands that, between the end of last season and the start of this one, the gap between his roster and a berth in the NBA Finals has only grown. The Sixers head coach did not say that explicitly when he confirmed that Fultz would be at center court on Tuesday night when the NBA's regular season tips off at TD Garden. But the sentiment was there, lurking in the undercurrent of his comments to the members of the media who gathered around him before the team puddle-jumped north to Boston. It was there in the rhetorical question he submitted when explaining his decision to bring JJ Redick off the bench. "How do you deliver a team to the end of April and May — and, we sure hope, June — that is better than when it started?" Brown said. The implication was both impossible to miss and entirely accurate. In order for the Sixers to get where they hope to be going, they will need to be better at the end of Game 82 than they are right now, at the dawn of Game 1. They will need to be much better. That's the only conclusion anybody could possibly draw given all that has transpired in the Eastern Conference since the Sixers' five-game loss to the Celtics in last year's semifinals. First, Boston's injury-riddled rotation erased any doubt about its legitimacy by taking LeBron James and his supporting cast to a decisive seventh game before finally bowing out. The Celtics then kept the entire gang together through free agency, re-signing Marcus Smart while welcoming back all-stars Irving and Hayward from the injuries that had ended their seasons. The transaction page might say that Danny Ainge's offseason was limited in its scope, but the additions of Irving and Hayward effectively juiced the Celtics bench with an almost unimaginable level of talent in the form of Smart and the breakout star of the 2018 postseason, point guard Terry Rozier. Together, they represent two-fifths of the starting unit that toppled the Sixers in five games. On Tuesday, presumably, they'll be wearing warmups when the action starts. Yet as formidable as the Celtics are, there's an argument to be made that they are not even the deepest team in the East. That honor might go to the Raptors, who suddenly have a team with the kind of defensive chops that can prompt some legitimate thoughts about how they might match up with the Warriors. With the additions of Leonard and Danny Green and second-year up-and-comer O.G. Anunoby on the wing, Toronto has the kind of length that plays huge in today's NBA. In addition to incumbent point guard Kyle Lowry, Toronto has a solid backup in Fred VanVleet (.414 from three-point range on 3.4 attempts per game last season), and a couple of starting caliber bigs in Serge Ibaka and Jonas Valanciunas. All of which sets the stage for one of the ironies of the Sixers' current moment. Not since the early days of the Iverson era — and perhaps even before — have they fielded a roster with this much talent and potential. And, for the first time in 15 seasons, the path to the NBA Finals does not run through LeBron James. Yet the conference might be better than it has been at any point since dawn of the Tank. When the Westgate Las Vegas Super Book released its win total over/unders this summer, it marked the first time since 2013-14 that three Eastern Conference teams were pegged at 50-plus wins (the Sixers and Raptors' totals debuted at 54.5, the Celtics at 57.5). "You've named the teams that we're looking at," general manager Elton Brand said. "We've seen what they have done, and I acknowledge how good those teams are and could possibly be. . .Those are the teams we're looking at." Right now, the NBA economy is similar to that of the nation in which it exists, the flow of resources moving unmistakably upward. Competing in that sort of environment requires a superstar. It's why Brown and the Sixers did not demure about their intentions at the start of the offseason, and it's why they are now charging head first into Plan B. All along, they knew that if they were unable to land a game-changer via free agency or trade, they were going to need to do whatever they could to develop such a dynamic internally. In Ben Simmons and Joel Embiid, the Sixers have reason to think that some of the ground they have lost to the Raptors and the Celtics might be made up by way of the exponential progress that young superstars are wont to make. Throughout the preseason, we've seen signs of it from Embiid, who has yet to approach his Shaq-like potential in the offensive post. With Simmons, it wouldn't be a surprise if his biggest strides come on the defensive end of the court, where he has the length and athleticism to become a disruptive force. That, along with improved efficiency on the offensive end, would pay significant dividends. "Those two guys are the superstars that we have that will propel us to wherever we get," Brand said. But the X-Factor is Fultz. The hope inside the Sixers is that he can become their new addition, the answer to Hayward and Irving and Leonard. Jumpshot or not, he can make a difference, on both ends of the court. He can give Brown the luxury of keeping an elite ballhandler and shot creator on the court even when Simmons checks out, and he can match up against the primary ballhandler that starts opposite him. That's the hope. To make it reality is what the regular season is for.